Set of 18 wooden coasters featuring album-artwork from KISS in a minature guitar case replica. Entertainment Earth Convention Exclusive! This astonishing set of 18 coasters is derived from KISS album artwork. 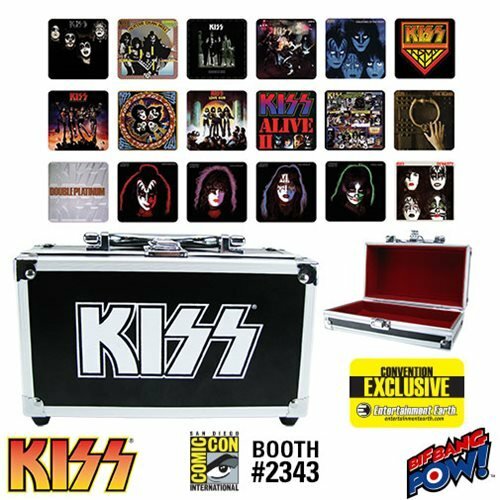 Each coaster is crafted from wood with cork backing, measures approximately 3 1/2-inches square and displays a 4-color image unique to a specific album including, KISS, Hotter Than Hell, Dressed to Kill, Alive, Destroyer, Rock and Roll Over, Love Gun, Alive II, Double Platinum, the solo albums of Gene Simmons, Paul Stanley, Ace Frehley and Peter Criss, Dynasty, Unmasked, Music from the Elder, Creatures of the Night and includes one coaster with the KISS Army logo. This rockin' set of coasters arrives in a miniature guitar case replica with a KISS logo on each side and an interior lined in smooth red velvet. This limited edition set of 1,000 pieces comes individually numbered with a holographic sticker. Ages 14 and up.